You are here: Home / NREMT Exam / What Is the Best AEMT Practice Test? If you are currently taking advanced EMT coursework, or if you are thinking about becoming an advanced EMT, you may hear a lot of your colleagues and classmates talking about the NREMT exam, also known as the National Registry. If you’re unfamiliar with this test, here’s a bit of background for you, including the best way study guides, practice tests, and simulation exams you can find to help you get prepared to hopefully pass on your first attempt. 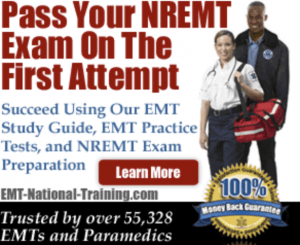 And, if you’re serious about passing the NREMT exam, you can find online EMT and Paramedic practice tests that will try to help you pass the examination on your first attempt. How does Advanced EMT fit into the EMS tiers of care? The EMS system in the United States is currently in a state of flux. The National Highway Traffic Safety Administration (NHTSA), which is a division of the US Department of Transportation (DOT), and the American Heart Association (AHA) decide on the national standards to which they would like all prehospital providers to adhere. As such, the National Registry administers exams to certify emergency care providers to these uniform standards (see below). However, each state also has its own requirements for EMS licensure, and while some recognize the National Registry exam, others do not. Furthermore, there are currently three levels of prehospital EMS care between EMT-Basic and Paramedic: I-85, I-99, and Advanced EMT (AEMT). The DOT and many EMS organizations would like to see a more unified approach to EMS care, and are phasing out the I-85 and I-99 levels, leaving AEMT as the sole tier between Basic and Paramedic. While some states will continue to use the other tiers and offer state tests for those levels, it is felt that eventually all EMS providers will have to merge with the DOT standards. Why is the Advanced EMT license important? For some EMTs, it’s a chance to test the waters before making the jump to Paramedic, which entails quite a bit more coursework. Others don’t have the time for two years of paramedic training or the financial support of their fire departments for a full paramedic license. Also, some communities use their Advanced EMTs quite well, integrating them with paramedic units for efficient and cost-effective patient care. It’s highly probable that more areas will employ this strategy as the other EMS tiers are phased out, and this will create more job opportunities for Advanced EMTs. The curriculum for AEMTs may evolve as well to include more of the skills now practiced at the intermediate (“I”) level. 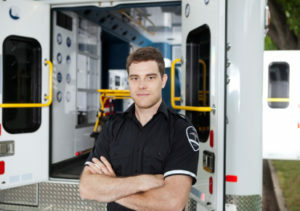 EMT and paramedic jobs are predicted to grow dramatically and faster than average between 2014 and 2024, according to the US Bureau of Labor Statistics. The National Registry exam for Advanced EMTs is a vital part of the licensing process for many EMTs, as well it should be. Some states won’t allow you to become licensed or re-licensed without passing the exam, and many have reciprocity rules in place when it comes to having National Registry status. This makes it much easier to move your license to another state should you need to move or find better EMS jobs outside your current state. Passing the National Registry exam as an AEMT shows your department or a potential employer that you are career minded. Some fire departments or private ambulance services won’t hire without it. NREMT status also gives you confidence when entering the field for the first time, as the test is a very rigorous criterion for the ability to provide top-notch patient care. Many AEMTs feel like they owe it to their patients and the EMTs they ride with to maintain National Registry certification. When you study at the level needed to pass this exam, you will automatically improve your performance in the field. Getting EMTs nationally on board with NREMT standards would be a major step in increasing the level of prehospital care across the entire country. Where can you find the best AEMT practice tests? At the AEMT level, there are limited options for online study sites; there are far more apps and programs for Basic and Paramedic levels. However, EMT National Training offers a comprehensive exam prep program for Advanced EMTs that will do a great job of getting you ready for the NREMT test, and it will also help you pass any state tests you need to take. EMT National Training has a selection of over 3,000 practice questions that you can assemble into short quizzes of 10 to 50 questions or full-length simulation exams like the real thing. Your quizzes can draw from all five areas of study, or you can focus only on those areas in which you need the most help. The questions are developed by working EMS personnel and EMS instructors, and they’re updated frequently, so you know they’re just like the ones you’ll find on the NREMT exam. All answers to every Advanced EMT practice test come with the rationale behind them, so you learn the “whys,” not just the “whats” of EMS care. If you’re still stumped by any question, EMT National Training offers exceptional customer service, again with real EMS providers, via phone or email. The EMS system in the US is still evolving, but the Advanced EMT provider is a growing area of study and practice. If you decide to pursue this level of prehospital care, do yourself a favor and take the NREMT exam, whether it’s required or not. You’ll be more employable, and you’ll always know that with National Registry status, you are providing the best care possible. That confidence will serve you well in the field. For more information about EMT Practice Tests, be sure to visit EMT National Training’s subscription service. How does the National Registry exam work? The National Registry exam for AEMTs is separated into two sections. You will be required to pass both an online cognitive exam and a psychomotor, or practical, exam. The practical exam consists of completing hands-on skills at various stations, such as trauma and respiratory care. A test administrator will check you off as you go through each station to make sure you performed all the skills required at each station. The good news is that you can access the same checklists the test givers use at the National Registry website. Not only can you use these skill sheets for your psychomotor exam study but you can use them to help you study for the cognitive exam too. There will be many questions on the cognitive test that ask you about the order in which care steps are provided, and knowing the skill sheets in your sleep will help you nail these questions. Signup and administration of the test are much more efficient. The data from the tests can be analyzed more easily at less cost. Exam questions can be updated simply as needed when protocols change. Test takers get their results back much faster (usually within a few days). You will have two hours and 15 minutes to complete the exam, which consists of 135 questions. Approximately 85 percent of the material relates to adult patient care and about 15 percent to pediatric care. The exam covers the same five areas you will have studied in class: EMS operations; trauma; medical emergencies, including OB/GYN; respiratory care (airway, respiration, and ventilation); and cardiac emergencies with resuscitation. At present, other EMS levels take a computer adaptive test for the NREMT, which means each question is determined by your previous answer. Get a question right, and the test moves on; answer incorrectly, and the test gives you another in the same vein. It would not be surprising to see the AEMT exam move to this format in the future. Why Online Study for passing the NREMT? Most AEMT students are serious about their studies and take excellent notes. This is a good first start in preparing for the NREMT exam. However, the hardest part of studying for the test is usually predicting the types of questions on the exam. You can purchase study guide books with practice questions, but these often become outdated very quickly. It’s better in most cases to find an online study program the most closely mimics the real exam by offering online practice tests. Online practice tests let you get in the habit of taking tests via computer, which actually uses your brain in different ways than conventional paper tests. You’ll be assured, if you use a high-quality program, that the material is always current. You’ll also be able to track your progress when you take multiple practice tests. Please join our Paramedic Training Spot Facebook page! How to Find the Best EMT Test Prep? How to Pass the NREMT Exam On Your First Try? EMT certification in Louisiana can be obtained after passing the national level certification exams.